Meet new SES Principal, Christine Miczan! On Jan. 14, 2019, the Solvay Union Free School District Board of Education appointed Mrs. Christine Miczan as the new Principal of Solvay Elementary School. Mrs. Miczan has over 21 years of experience providing a safe and positive environment for students and staff. 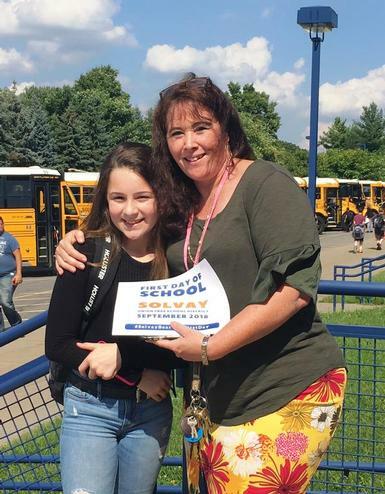 For the past year and a half, Mrs. Miczan has been the Assistant Principal of Solvay Middle School working with students, staff and families. Prior to working at Solvay, Mrs. Miczan worked for the Syracuse City Schools as a social studies teacher. Mrs. Miczan received her bachelor's degree from Buffalo State College in social studies education and her master's degree from Le Moyne College in special education. She taught at various levels and developed a variety of successful programs. She continued her education and professional goals completing her Certificate of Advanced Studies from Syracuse University in education administration. Mrs. Miczan lives in Solvay where she raised her family and is an active community member with various local organizations. Learn more about Mrs. Miczan here. Please join us in welcoming Mrs. Miczan to Solvay Elementary School!